An anti-Brexit campaigner shows her support for Europe waving a European Union flag outside Parliament in London, March 25, 2019. FILE - British Prime Minister Theresa May leaves after addressing a media conference at an EU summit in Brussels, March 22, 2019. 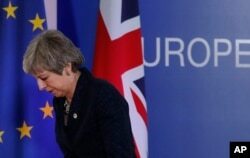 Monday's vote was an attempt to find a way to come up with such a plan European Council President Donald Tusk said last week that all Brexit options were still open for Britain until April 12, including a deal, a departure with no deal, a long extension - or even revoking Article 50 and remaining in the EU. 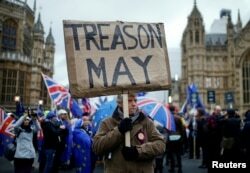 FILE - A pro-Brexit protester holds a banner as anti-Brexit protesters demonstrate outside the Houses of Parliament, ahead of a vote on Prime Minister Theresa May's Brexit deal, in London, Jan. 15, 2019.